The 5th Avenue Theatre is Seattle's premier musical theater. In 1980, the non-profit 5th Avenue Theatre began producing and presenting top-quality live musical theater for the cultural enrichment of the Northwest community. The 5th Avenue Theatre maintains a subscription audience of more than 24,000 and an annual attendance of over 225,000. It ranks among the nation's largest and most respected musical theater companies. The Theatre is committed to encouraging the next generation of theatergoers through its Educational Outreach Program which includes: The Adventure Musical Theatre Touring Company, The 5th Avenue High School Musical Theatre Awards, the Student Matinee Program and Spotlight Nights. 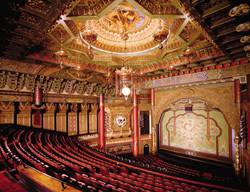 Unique in its Chinese-inspired design, the exquisite theater opened in 1926 as a venue for vaudeville and film. Today, under the leadership of Managing Director Marilynn Sheldon and producing Artistic Director David Armstrong, The 5th Avenue Theatre continues to achieve the highest standards in all aspects of artistic endeavors and facility operations, while preserving its artistic, architectural and historic legacy.